Four people were hurt, including an occupant of the home, and taken to a hospital with minor injuries, a fire official said. A two-vehicle accident in Plainview Friday morning sent a truck crashing into a pole and a car smashing through the side of a home, injuring four people, officials said. The crash occurred just before 10 a.m. near the corner of Manetto Hill Road and Country Drive, Nassau police said. 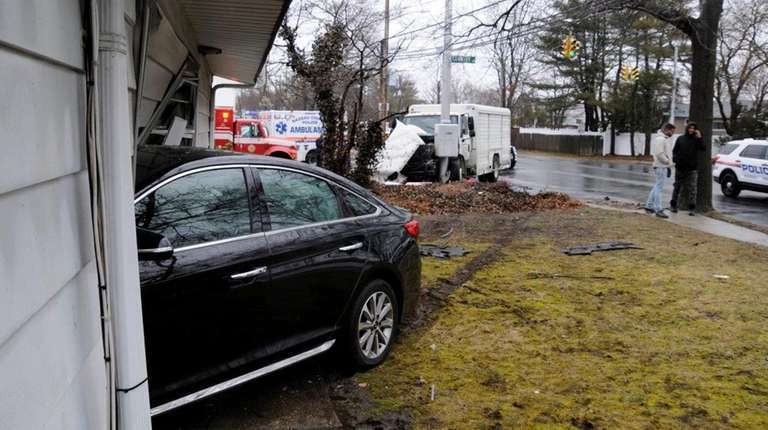 A white box truck hit a black sedan, which careered into the side of a home, said Erik Rivera, deputy chief of the Plainview Fire Department. One occupant of the home suffered minor injuries and was brought to a hospital, Rivera said. The two occupants of the truck and the driver of the sedan also suffered minor injuries and were taken to the hospital, he said. Police said no arrest was made.